When do I need to provide my credit card? After your 30-day free trial expires, the next time you login, you’re prompted for your credit card information to continue using the system. We bill you $39.99 for a full-year subscription. If you’ve added options, they’re added to the total at checkout. Your credit card will be automatically billed at your next annual renewal date. Your information will be securely processed. We do not store any of your payment information on our servers and it will only be used by our certified Merchant Bank Partners. We do not provide refunds. Once the 30 day free trial is completed and you purchase a membership you will have access to the site for the subscription period. You can cancel your account anytime by contacting Support with a message saying that you’d like to cancel. If your account has been automatically charged within a few days of your contacting us we will process a refund of those charges. What if I need help setting up Maintain My RV? We are here to help. We have provided helpful video tutorials and instructional manuals for setting up and using Maintain My RV. You can visit the Documentation page as well as the Video Tutorial page to access them. If you still need assistance you can use our Support page to create a support ticket or send us an email at support@maintainmyrv.com we’re happy to help however we can. No, but our website is fully responsive. You can easily view all information on your mobile devices, because it adapts to them to a small screen automatically. We do plan to release a mobile app in the future. Is my maintenance schedule backed up? Yes, we perform backups multiple backups to different locations at least every day, and sometimes more often. Rest assured your information is safe and securely backed up regularly. It’s always available when you need it. Can I download my maintenance logs? Yes, today you can download all of your activity in our easy to use reports. We are working on an MS Excel download format for a future release. What if my subscription lapses? What happens to my information? Our subscription plans renew automatically, so you needn’t worry. However, if for some reason your account was not able to be automatically renewed, we maintain your records for up to 3 years, so we’ll still have everything on file, even if you decide to leave and return later. If you want to remove your data, just contact us. Your information is always safe with us and we do not share with 3rd parties. What if I can't find my equipment in the system? We are adding new equipment all the time but there is a chance we haven’t yet made it to your specific equipment type, make or model. You can select the other option in the equipment setup screen to enter your equipment based on your documentation. You can also contact Support and we will be happy to work with you to get your specific equipment loaded into the system as soon as possible. Where are the preloaded maintenance schedules from? We are always working to add additional equipment to our system so you can an just point and click to add all of your equipment and create a maintenance schedule per the manufacturer’s guidelines. We use schedules from the manufacturer which we obtain directly from their website, owner’s manuals and other documentation. If you can’t find your equipment on our system, let us know and we will get it added ASAP. What are the system requirements for Maintain My RV? 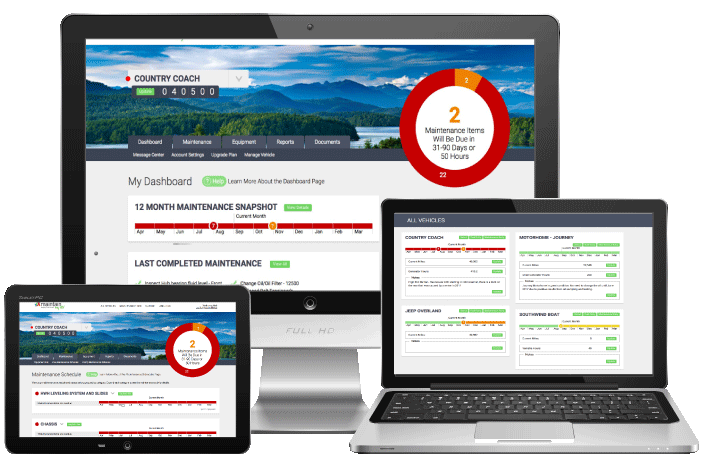 Maintain My RV is what’s called a “cloud based” system which means there is no software to download, providing you the flexibility to use the system on a number of different devices where you have internet access. The application is thoroughly tested on Microsoft PC, Apple Mac OS, IPAD, and IPhone, using internet browsers Safari, Google Chrome, Internet Explorer, and Firefox. The application should run on any standard internet browser from most all tablet and PC devices. We are working on a mobile application that will be available in the future.